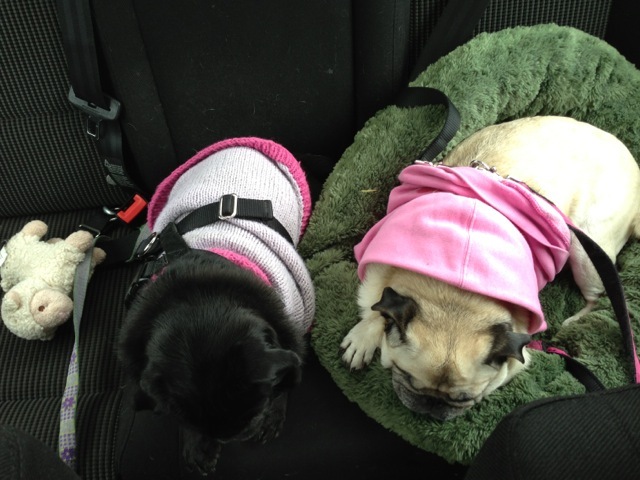 Despite what they try to tell you, pugs cannot live on cuddles and kibble alone, so a few days ago, I suited the girls up, clipped them into their seatbelts, and took them off on a little adventure. Yes, Lola. Merry gets your bed when she’s in the car. It’s all part of being a good host. Park your puffy lips of disapproval somewhere else, please. Well. Okay. They’re kinda cute. You can keep them. 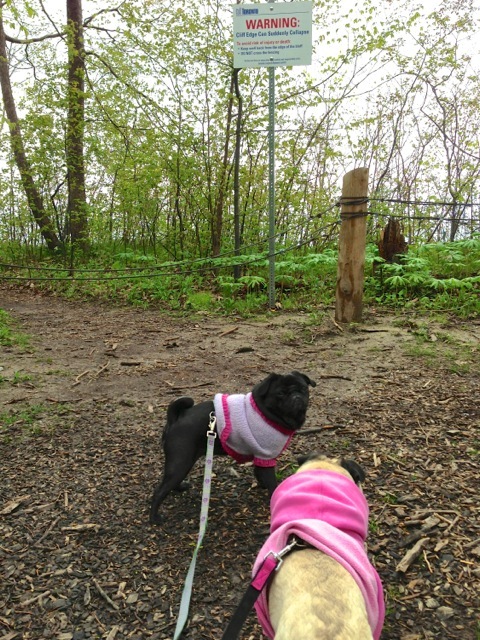 I picked a place that would have LOTS of smells, and would be relatively stick-free for the sensitive eyeballs of the snorfelling, not-always-so-careful-when-surrounded-by-sharp-objects pugs. …but, really, there never was and never will be any chance of us even getting close to the edges of those cliffs. All in all, although the walk was more of a meandering mosey than a hike, the girls were worn out from the adventures and the sniffing (and the pre-hike nail dremeling). 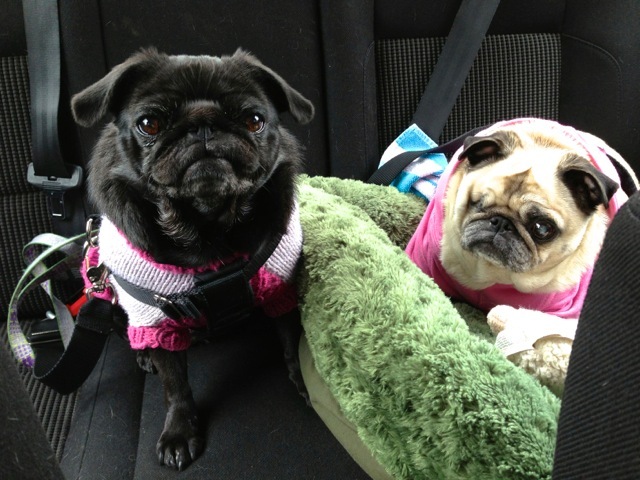 Despite the pugs trying to convince me that kibble and comfy beds are all they need, I know better. There is nothing better than a happy, tired pug. Lola you are so sweet to let Merry sit in your bed! Oh, mama had me in my seat belt, or I would have booted her out of there. I’m just learning how to share. Mama says it’s good for me. Lola, your pout is awesome. But it looked like Merry had your number! And your mom is right, nothing beats a tired, happy pug. The very different expressions in this post are killing me equally! Wish I was on that hike with you three. 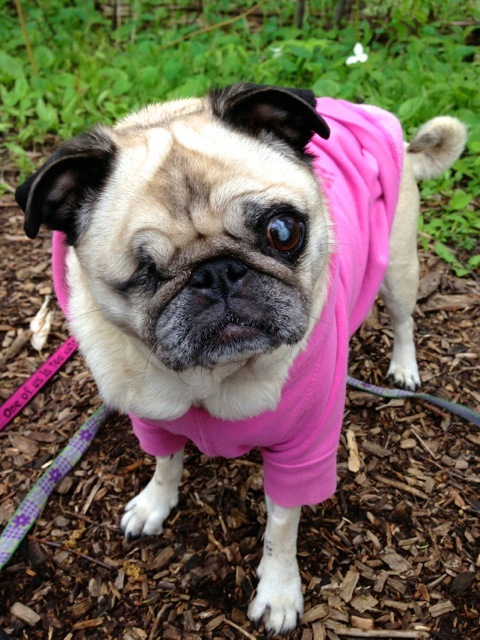 Lola, your puffy puggy lips are a riot! I just love them! And you are sweet to let Little Miss Merry sit in your special spot! What a fun outing! 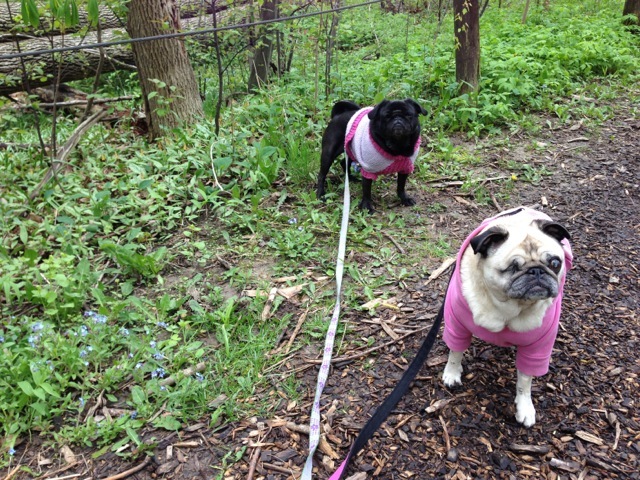 OMP they are both too cute for words in those little outfits exploring nature! Such a good host Lola is!